The children were truly amazing. From when the first ones arrived they started an elaborate game based upon a camping trip. As others arrived they simply joined in. They reluctantly pulled themselves away for morning circle, and then rushed back to their play straight after. They were so engrossed that we had snack later than usual – I was waiting for a lull in the play, but it never came. Then, after snack they insisted on continuing their camping trip rather than playing outside. I have never seen them so involved before so I agreed. Even at the end of the morning there were protests when it was time to get ready for storytime and lunch. Maybe others see this in their class but it is new for these children. It was so wonderful to see. They communicated well with each other and there was no conflict. Really, no conflict! At one point I took a photo of the floor in the middle of the room. it looked like such a mess but I had seen it develop and understood that everything that was there had a purpose. They were planning a camping trip and defining their roles in a family group. They the packed up the car with everything they needed. Apparently they had some crying babies who needed a lot of care along the way! They then acted through the entire overnight camping trip. Well, apparently I announced storytime before they were able to have breakfast! They said they would continue building their bonfire and cooking their breakfast tomorrow. Days like this are so inspiring for me. your post today really resonated with me … part of my practice as a teacher-trainer over the years has been to help others (volunteers, observers, future ece professionals, staff) use their observation skills before passing judgement about what they see. adult lenses are so judgemental some times. 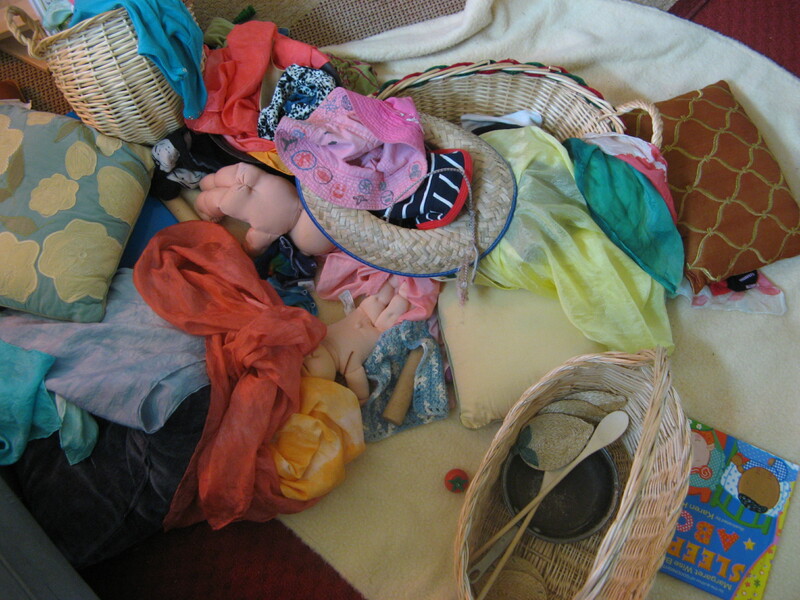 one of the most powerful things that happened in our classroom was when we made a collective efforts as adults to refer to the by-products of children’s play as their “work” and to ask them to clean up their materials or their “work” even if to the adult eye it might have looked like total chaos or a real honest to goodness mess! there was a noticeable difference weeks after the shift in how the children talked about their work too, and how they valued each other’s efforts as well! and, i have seen my fair share of indoor “camping trips,” “picnics” and “bonfires”! This is great, thanks for the input Mia. I too always refer to the children’s “work” rather than play. It does give their explorations importance. It is incredible what young minds are capable of creating on their own. They are master synthesizers of information and stimuli. I think as teachers and parents we need to recognize when to guide and teach and when to step back and simply observe and appreciate.